Why is it that both political campaigns feel the need to have their own social networks. Barack Obama has my.barackobama.com and John McCain has McCainSpace, which just relaunched with a new design from KickApps after failing massively on its own. 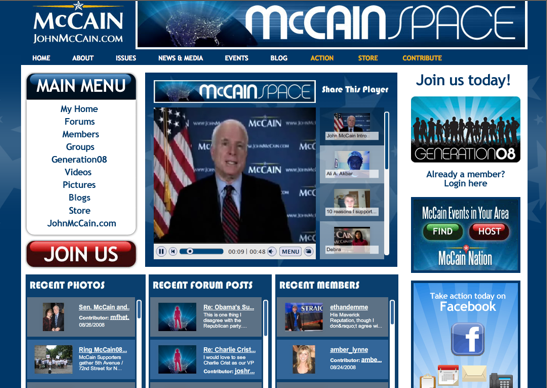 The new McCainSpace design itself is functional enough, giving McCain supporters a central place to discuss election issues via blogs, forums, videos, and photos. But I’m not sure who the site is supposed to appeal to other than lonely Young Republicans who don’t have any friends on Facebook. The site is aimed at “Generation08,” presumably the young’uns that the campaign is having a hard time reaching. The logo and default photo image remind me of something out of Close Encounters of the Third Kind (remember that scene with the alien light coming through the doorway?) And then there’s the welcome video of McCain on the homepage (embedded below), saying “Greetings my friends.” Greetings, gramps. Creating a separate social network makes little sense in the age of MySpace and Facebook. But McCain isn’t doing so good on those sites. He has only 226,000 “supporters” on Facebook, compared to 1.4 million for Obama. 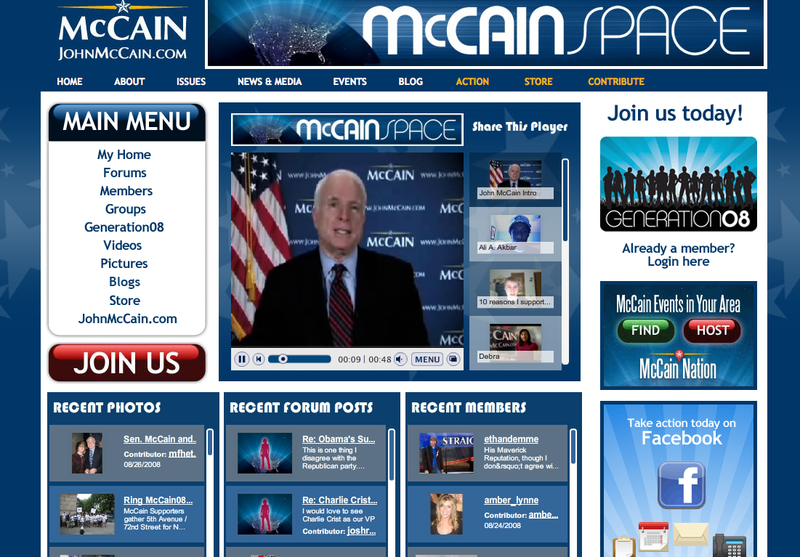 But maybe that’s just because he’s more of a MySpace guy (note the similarity of the McCainSpace name). But even there, McCain only has 66,665 “friends” versus 467,814 for Obama.